Last updated March 3, 2001. The smallest actual ships (as opposed to boats) in the Pirate Game are designated "cutters" and "brigs." In real nautical language, both these terms refer to specific styles of rigging. Not all the game cutters are cutter-rigged, and not all of the game brigs are true brigantines, but the names work well for the game. Unlike the larger ships, cutters and brigs do not use the special hull pieces. They start with a relatively small special element which forms the bow; the rest of the ship is built up from standard pieces. It's not even necessary to use a special ship-mast piece . . . a good mast can be built up from 1x6 or 1x8 pieces (see below). In the game, a cutter is the Class 1 ship -- the smallest true ship. Class 1 means it can carry a single cannon. 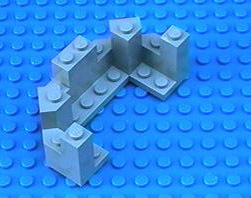 The prototypical cutter is the small ship from Lego's Imperial Trading Post (6277). This pretty little ship has about 110 pieces. Its bow is built up from a 6x7 tapered baseplate and two identical 6-stud-wide Cutter Bow elements (also known as "Inverted Multi-Taper Boat Hull" — see the picture below). Her midsection tapers out to a width of 8 studs. The one in the illustration has been modified slightly for the game; it doesn't come with a cannon. Kevin Loch's Net Server has the complete instructions for the Imperial Trading post set here. The ship assembly instructions are found at scans 03 through 08. Studying how this ship goes together will make it easy for you to create similar designs of your own. 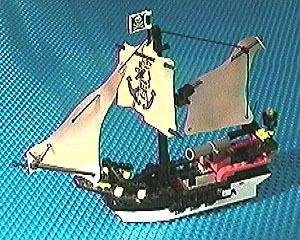 Cutter Bows were found in several old Lego Castle and Pirate sets; the Sea Serpent had four black ones! They are still available in some Divers sets. I'm not aware of any non-Lego versions of this piece. Note, though, that you can "stack" multiple Skinny Cutter Bows diagonally to build up a taller, raked bow. There's also a piece which I call the Skinny Cutter Bow Extension, which can fit on top of the Skinny Cutter Bow. 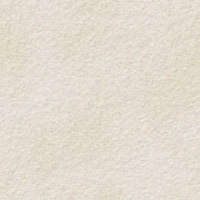 I'll try to post a photo before long. 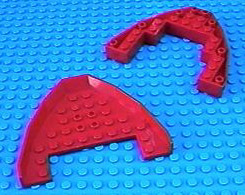 These skinny bow pieces are also still in production by Lego; they seem to have been intended as car or aircraft bodies. I found a reference to this piece as the Cockpit 4 x 11 x 2 & 2/3 with Ldraw number 6058. A gray one comes in the Bi-Wing Baron set (#5928). They come in yellow, white, and black, as well. Finally, we have the wide red bow pieces shown to the left . . . the U-shaped one goes below the other one, which provides a sort of foredeck . . . I have found names and Ldraw numbers: Boat Base 8 x 10' (2622) for the regular bow piece, Boat Bow Top Large 8 x 10 (2623) for the foredeck piece, and Boat Bow Plate 10 x 9' (2621) for the plate that goes under them. If these were generally available, they'd be a good way to start a brig, but apparently they have not been in many sets. I'd like to get my hands on a few . . . If you can't find the special mast pieces to complete your cutter fleet, you can build perfectly good masts out of overlapping black 1 x 6 and 1 x 8 plates. The only tricky part is mounting the mast in the cutter's hull. The photo shows how I did it. 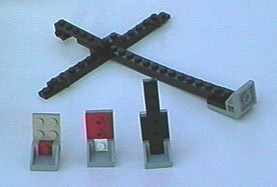 Shown are a completed mast (lying down) and three stages of building it up. Start with the right-angle element visible at the base of the mast. Use a 1x1 plate, and two 1x2 plates with single center studs, to build it up to accept the 1 x 8 black plate vertically. Then attach another 1x 8 black plate behind the first one, overlapping by 3 studs. Continue until you reach the desired height; top off with 1 x 6 if 1 x 8 gets a little too tall. See the picture of the skinny-bow cutter with the two triangular sails; it uses this type of mast. A half-octagonal "castle turret" piece makes a good sterncastle (that is, the built-up part of the aft end of a ship). Here's a gray one; they also come in (at least) blue, white and black. In the game, a "brig" is built in the same way as a cutter, but it's longer, and reverse slopes are used to increase the amidships width. A brig is one type of Class 2 (the other kind of Class 2 is built on a regular hull with no center sections, like the Cross Bone Clipper). A Class 2 can carry two cannon. More pix needed - A brig. More cutters. A skinny-bow cutter. New third piece.